Stand by for political realignment in America! Summary: I’ve long believed that our political system has rapidly accumulating strains, soon to rip the system apart so that new coalitions emerge, centered on new issues — political realignments (see Wikipedia), as has happened before in American history. Not the widely anticipated move to the “middle” (a two-dimensional line), but political reshuffling in multiple dimensions. Perhaps we now have the first signs of it happening. On the other hand, just as the first Robin doesn’t mean Spring has begun, rising stress does not mean the realignment has begun. The Right, and especially its vanguard — the Tea Party movement — have become servants of the 1%. They’re helping the 1% build the New America described in scores of posts on the FM website. They are one possible future for America. A belligerent foreign policy, supporting a mad unprofitable empire. Political divisions between hostile races and religions. Growing inequality and falling social mobility (e.g., defunding public schools and universities). Tax burden shifted, as the GOP is doing in the States, from the rich to the middle class. It’s a common pattern in history. It’s a change from the America-that-once-was. It’s a slow-motion revolution. It might push some into defecting from the Right to a new movement closer to their conservative principles. 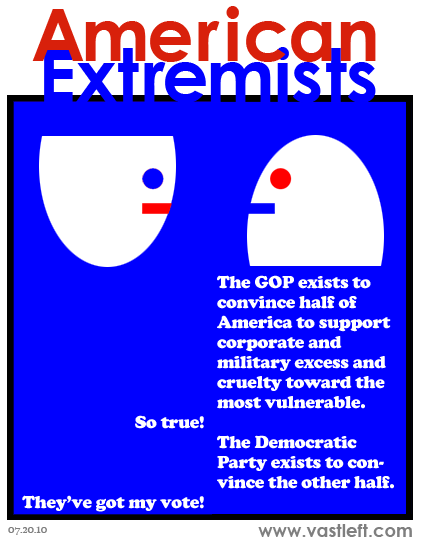 Looking to the future, neither the GOP nor its Tea Party faction are all grey-hairs. As shown by this Pew Poll, published 16 October 2013. The Republicans are slightly light on Millennials (born after 1980, so age 18 – 33) and slightly heavy on Boomers. The Tea Party movement is catastrophically light on Millennials and over-weight on Boomers. The cutting edge of society in terms of youth and energy is not with the extreme Right. There is no equivalent of the Tea Party on the Left. After decades of decay, the Left’s too decrepit to have a broadly political movement; all that remains are single-issue groups. Like the unions and the environmentalists. With an aging membership, and a slow loss of public support. The average age of a conservancy member is 65. The average age of a new member is 62. Each year, those numbers creep upward. Only 5% of the group’s 1 million members are younger than 40. 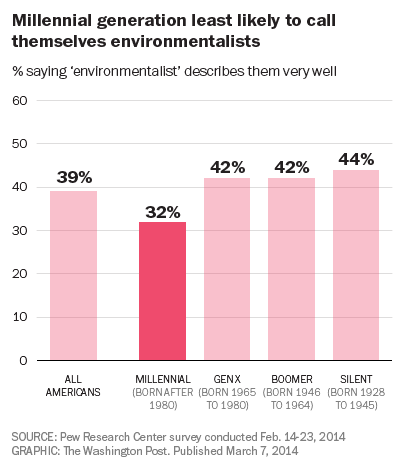 Among the “conservation minded” — basically, Americans who have tried recycling — only 8% recognize the group. Inspiration doesn’t cut it anymore. Love of nature is receding. The ’60s aren’t coming back. It’s a problem confronting all large conservation groups, including the World Wildlife Fund, Conservation International and the Wildlife Conservation Society. Beyond this for the Left, and its environmentalist wing, looms the likely (but not yet certain) defeat in the climate wars, into which they’ve invested so much of their credibility and resources. The sight of the gallows focuses the mind. Some on the Left have shaken off their dreams and begun to seek a new political foundations for the 21st C. For example, environmentalists are struggling to forge a new movement that can win in the 21st century. For example, see “Conservation in the Anthropocene: Beyond Solitude and Fragility“, Robert Lalasz, Peter Kareiva, and Michelle Marvier, The Breakthrough Journal, Winter 2012. The need for action exists, so the opportunity exists for them to grow, and perhaps even become the nucleus for a larger political coalition (environmentalism, central to many social and economic issues, is well-suited for this). Watch this space. Great nations and major political movements seldom die. They might fade, but often they refresh themselves from their historical roots — regenerate, and grow again. Previous Post Americans begin to learn, and change our views about our mad empire. What is not widely known is that the Democrats are a bifurcated party. They represent the very bottom and he very top. The bottom serves as cover for the top. But what you are hoping for is something that has never (or very very rarely) been true. That money will not control politics. Look at who could vote in early America. Those Revolutionary guys were realists. Unless you had a significant economic stake you couldn’t vote. We handle it differently these days. But the result is the same. 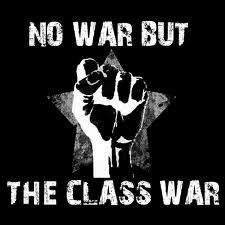 And why tax the middle class? Because the 1% don’t have enough money to pay for running the country. Yes it is more concentrated there. But it is still not enough. 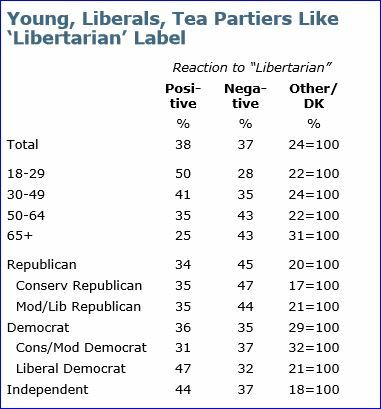 BTW the youth are trending libertarian. Look at the rousing welcome Rand Paul recently got in Berkeley. Berkeley! I blame it on the War On Youth. AKA Drug Prohibition. And you fail to mention what that means for the realignment you hope for. We have two big government parties. And the beginnings of a small government movement. The TEAs are actually a harbinger of that. Perfectly? Hell no – what is in politics? But they want to stop the growth. And that is the first step to smaller. Can you site any polling to support that theory. From memory, I recall that polls show that the “very top” show more support for the GOP than the Democrats. The middle class party allegiance varies over time, and by how defined. Wow, that’s really false. What we have now is control by the top few percent. 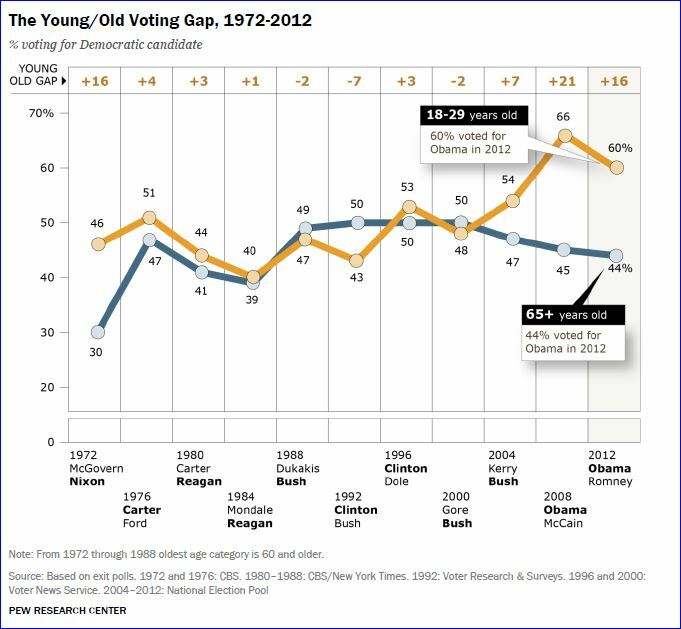 Even with the poll tax, early 19th century elections had turnouts of 50-60% of voting age population (i.e., men over the age limit). More generally, money has always been a powerful force in US elections. But magnitudes matter. It is extraordinarily powerful, following the increased concentration of income — and growing more so. True, but what’s you point? Who says that the middle class does not pay taxes, or should not pay taxes? Strawman much? I see no evidence that the Tea Party is a “harbinger” of anything. Support for the GOP is not growing. 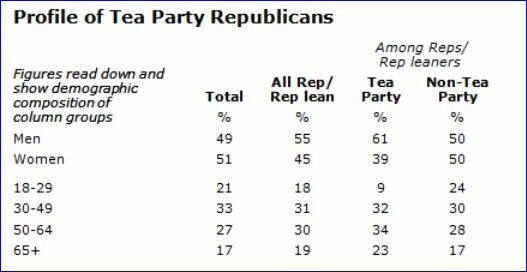 Support for the GOP shock troops call the “Tea Party” is not growing. On reflection, my previous comment was incomplete.